Age Has it’s Privileges – Looking Good! Baby Boomers and Seniors are rewriting the book on how to age. We are making up our own rules! Call us the Sandwich Generation or Generation Reinvention, we are being squeezed in many directions but determined to have some bucket-list fun along the way. My regular readers know that in addition to writing this blog, I also work in a Medspa. I know all the insider tips and tricks to look good at any age. Get Your Discount – You Earned It! For senior and baby boomer discounts, I am your “go to girl”. I maintain a long list of Senior and Baby Boomer discounts, some starting at age 50. 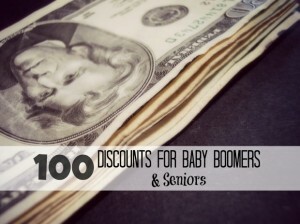 Here is a master list of now over 100 discounts for baby boomers and seniors. I curate content for those of us who are 50 Plus and Fabulous. I am gathering ideas and tips for makeup, hair, style, as well as health and fitness. I invite you to follow my Pinterest board here, and send me your favorite pins too! Let’s take this journey through the middle ages together!